I know it isn't Winter just yet, but it's getting pretty chilly here in the UK and I have started thinking about my Winter wardrobe and makeup.....we all go and grab berry shade lipsticks at this time of year don't we, or is that just me??? 1. Orange Slouch Curve Hem Crop Jumper £14.99 from New Look. 2. Purple Twist Stick Knitted Jumper £12.60 from Dorothy Perkins. 3. Pink Pom Pom Jumper £15.40 from Dorothy Perkins. 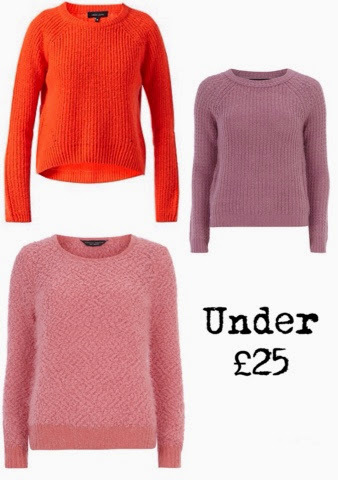 Dorothy Perkins have some amazing special offers on their range of jumpers at the moment, the majority of them are all under £25 and lots of them have been discounted, there is a huge selection online! 1. Chenille Cardigan £25.00 from H&M. 2. Shoulder Embellished Jumper £46.00 from Topshop. 3. Beige Oversized Cardigan £45.00 from River Island. I really need the River Island cardigan in my life, I think it's so pretty and would look great with some skinny jeans and flat boots, like the ones I got for a bargain price of £5 (you can see them HERE). Have you started getting your Winter wardrobe ready? This isn't a sponsored post, I just wanted to share with you what I have been lusting over!